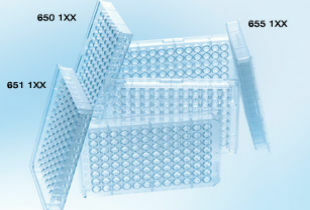 $80/case of 100 Greiner 96 well microplates, flat bottom, clear polystyrene. Used for protein quantification in protein assays. Free group shipping on orders $200. Manufactured from clear, virgin polystyrene and selected for optical clarity and consistency. Plates are available with flat-, round-, conical-, V-, and C-bottom well styles. C-bottom plates feature a flat bottom for optical measurement, but the hard corners are curved to eliminate liquid traps and improve plate washing. Greiner Bio One 96 well microplates with clear flat bottom is widely used in research lab used for protein assays / quantification in samples isolation from mammalian tissue cells or micro-organisms. The shipping cost for each item ordered is $9.50, but will be automatically waived at checkout on orders of $200 and more.